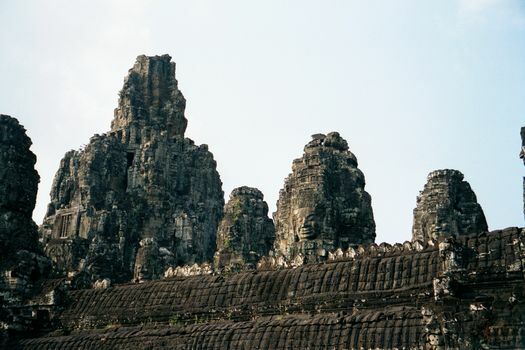 The famous Bayon, with its myriad towers and faces, rises at the exact center of Angkor Thom. 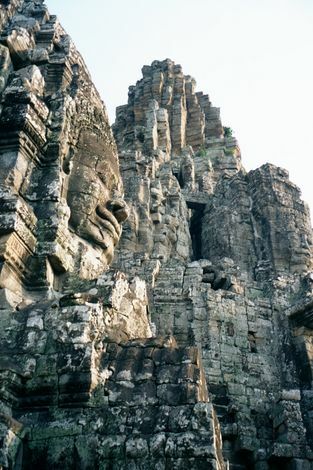 Just to the north and west of the Bayon--and occupying what amounts to the southeast quarter of the city's northwest quarter--there are a half-dozen other monuments, including the foundation of the royal palace and several temple-mountains that do not line up with the city's geometry for the simple reason that they antedate it. 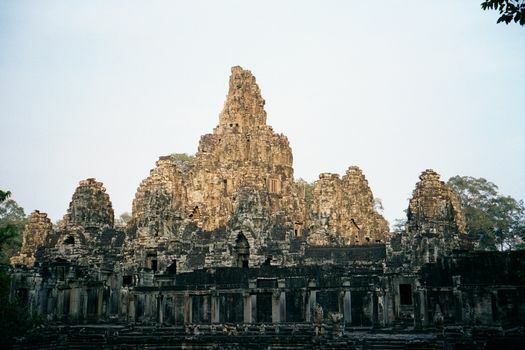 The Bayon, built a century after Angkor Wat, was much modified in succeeding centuries. It is a three-deck pyramid, but the tower-rimmed second deck almost merges with the third, while the third is almost filled by the broad base of a conical stone spire, which appears here like an inverted thumbtack. From closer up, the famous carvings on the towers become visible over the roofed gallery of the first deck. 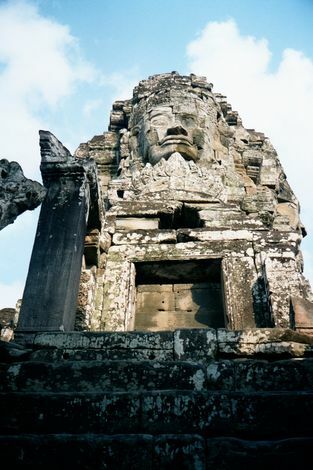 Until the 1920s, the Bayon was assumed to be a Hindu temple and the faces those of Shiva. 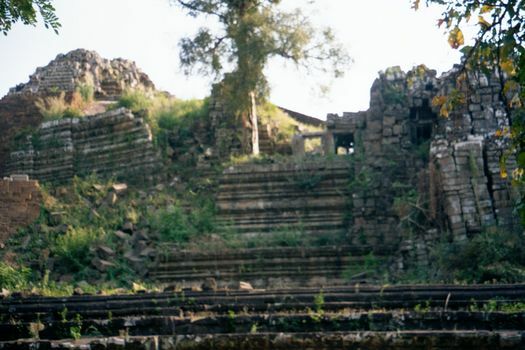 An inscription found in 1925 revealed that it was instead a Buddhist temple, built in the late 12th century by Angkor's most ambitious builder, Jayavarman VII. Here, the king portrays himself as Avalokiteshvara, the Compassionate Bodhisattva. Bodhisattvas are beings who have attained enlightenment but chosen not to enter Nirvana. Instead, they remain here to help less-enlightened humanity. In this case, the name Avalokiteshvara, "the Lord who looks down," is taken literally, not only to suggest a spiritual guide but a very temporal master. About 200 faces were carved on about 50 towers, of which 37 remain. 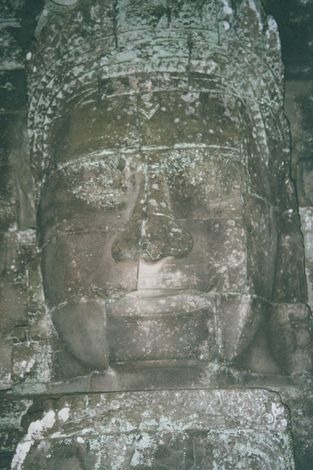 Many of the faces are worn away or demolished; here, one of the more intact ones. 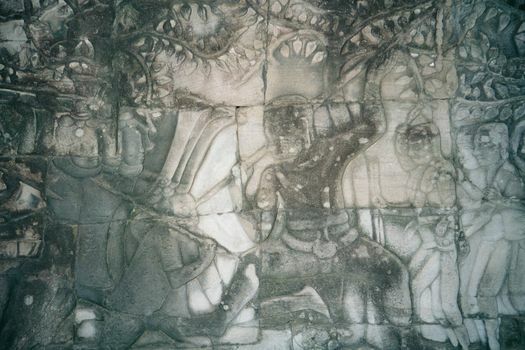 Lest this reading of Bayon and the gates of Angkor Thom seem too political, here is a carved panel from the lower deck of the Bayon: the sculptor shows a battle that actually occurred in 1177 between Jayavarman's army and their mortal enemy the Chams, from modern Vietnam. 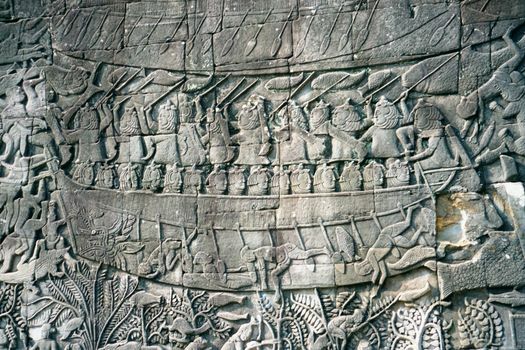 The battle took place on Tonle Sap, the Great Lake that lies a few miles south of Angkor and which in the wet season is navigable into the Mekong. 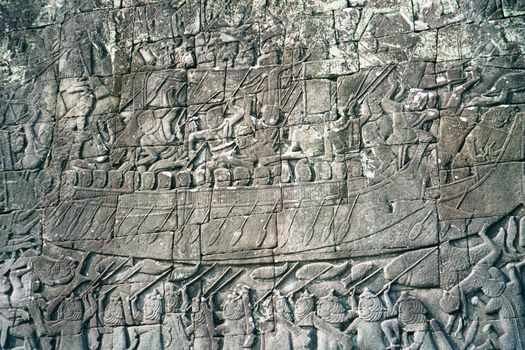 Jayavarman did in fact defeat the Chams, and their impaled bodies are shown here being thrown overboard. A gruesome panel, showing a spear being driven into a skull. 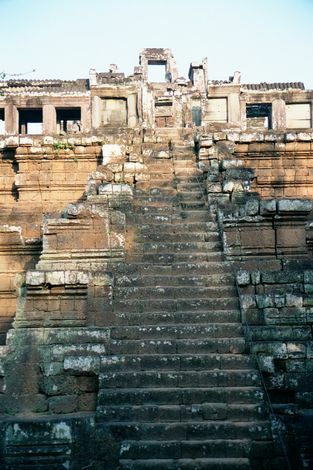 Immediately to the northwest of the Bayon is a ruined five-tier pyramid, which has been under reconstruction for the last 30 years. 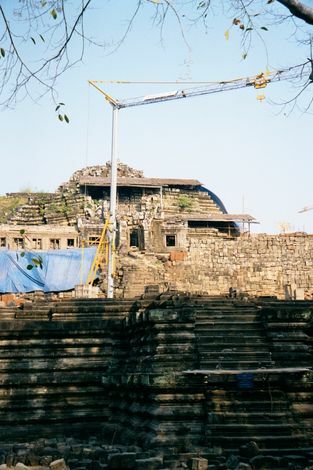 It is the Bapuon, built in the 11th century as the state temple of Udayadityavarman II. The reconstruction technology owes much to anastylosis, the methodical dismantling and reassembling method developed by the Dutch to repair Borobudur, a Buddhist monument on Java. The method came to Angkor after a visit to Borobudur in 1930 by Henri Marchal, who for 20 years headed the Angkor conservation office. 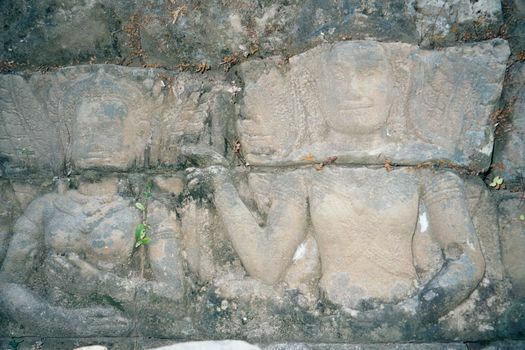 North of the Baphuon is the smaller and older (10th and early 11th century) Phimeanakus. It lies within the royal palace and was the king's private temple. According to Zhou Daguan, a Chinese emissary of the 13th century, the populace believed that the king nightly cohabited here with a serpent who appeared as a woman. There isn't much up top now. 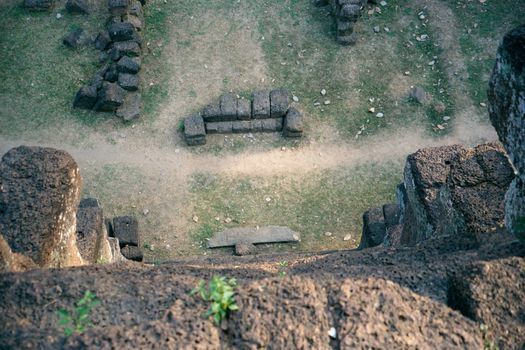 The view back down the laterite steps is guaranteed to focus your attention. 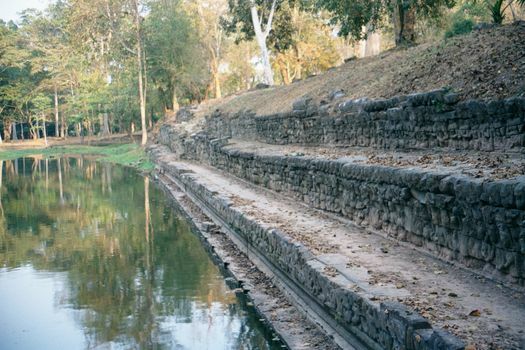 North of Phimeanakus and also within the perimeter of the royal palace, there is a large pool rimmed with laterite and once used for bathing and sports. The south wall of the pool is rimmed with reliefs. 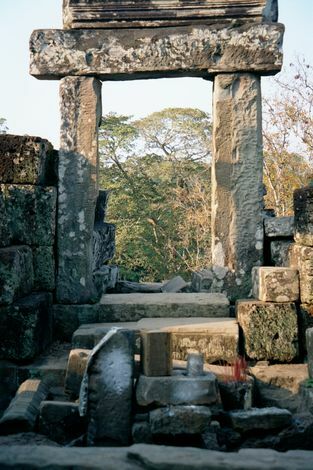 Still farther north and beyond the palace walls is the late (13th or 14th century) Preah Palilay. 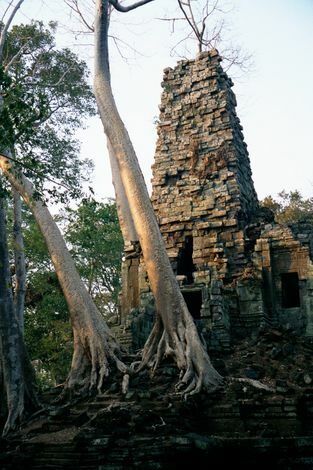 The word Preah is cognate with Sanskrit brah, "sacred," and the name Palilay is a corruption of the name of the local forest. There isn't anything left of the royal palace itself, despite the fact that it covered about 30 acres within a rectangle measuring about 250 by 600 meters. 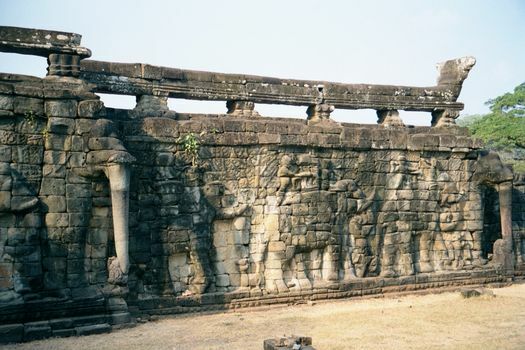 The most spectacular vestige of this mostly wooden complex is its eastern edge, which borders the road north from the Bayon to the city's north gate and forms a terrace carved with single- and triple-headed elephants.